The two hardest parts of lighting the Deep Space Nine kit from AMT (aside from the mind-numbing number of holes that must be drilled) are properly aligning the holes so they don’t look messy, and accurately locating them. 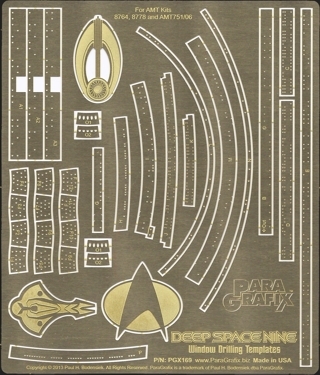 Drilling templates make lighting the Deep Space Nine kit from AMT easier and more accurate. Precisely located holes eliminate misalignment that comes from drilling “by eye” and duplicate exactly the window configuration of the CG model introduced in Star Trek: Deep Space Nine’s sixth season. This set can be used to drill holes for optic fibers if using the original, opaque plastic releases of the kit (8778) and optic fiber kit (8764), or to remove paint allowing light to shine through if using the new, clear release (AMT751/06). Requires 0.02”, 0.025” and 0.04” drill bits (not included). If making the opaque kit, the same sized optic fibers (also not included) are also required. Medallions of the three main forces in the series (Federation, Cardassian, and Bajoran) and can be used to decorate the finished kit’s base … or any other use the modeler wishes.